AFL-CIO Supports Black Friday Strikes Against Walmart : The Two-Way Since 2012, Our Walmart, an employee labor group, has been staging strikes on the day after Thanksgiving. The group wants workers to get more full-time jobs and make a living wage of $15 an hour. Customers in Bentonville, Ark., where Walmart's corporate headquarters are located, turn out for holiday shopping on Thanksgiving. The day after Thanksgiving is traditionally one of the busiest shopping days of the year. 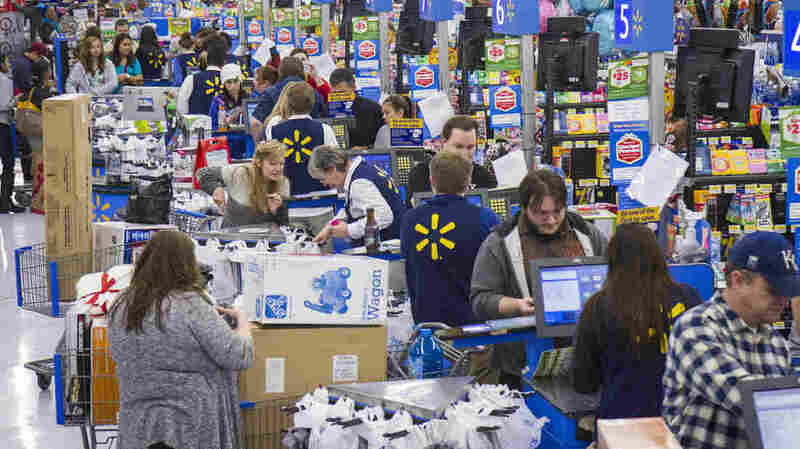 Bargain hunters heading to Walmart, in addition to looking for holiday deals, may find workers participating in Black Friday Strikes. Since 2012, Our Walmart, which is an employee labor group, has been staging strikes on the day after Thanksgiving. Employees at stores in six states and Washington, D.C., plan to participate and more locations are expected to join in. Our Walmart says it is standing up for better jobs. Members of the group would like to see more full-time work and an hourly wage of $15. Its website BlackFridayprotests.org is trying to gather momentum for the movement. It also encourages people to participate in the strikes and has information where they can find a protest near them. The AFL-CIO Tweeted: "Skip shopping and join a #BlackFriday protest in solidarity w/ #WalmartStrikers. In a statement, AFL-CIO President Richard Trumka said, "The entire labor movement will proudly stand with the brave workers at Walmart as they lead the largest mobilization to date for better wages and schedules." Walmart employs 1.3 million people in the United States. A statement on its website reads: "About 75% of our store management teams started as hourly associates, and they earn between $50,000 and $170,000 a year — similar to what firefighters, accountants, and even doctors make. Last year, Walmart promoted about 170,000 people to jobs with more responsibility and higher pay."